With thousands of treasures to choose from in the Shure Archives, it's impossible to say which are the most important. Each has a story. In this series, I'll share with you some of my personal favorites, starting with the Unidyne® Prototype Display Case. My involvement with documenting Shure history dates back to 1995. The company's 75th anniversary was looming in 2000. To commemorate it, I suggested a book celebrating the company's history. Much of the content came from a small, crowded archive closet. The engine of today's legendary and best-selling SM58® is a Unidyne III cartridge. That makes the Unidyne, now in its seventh generation, one of the most important chapters of the Shure story. 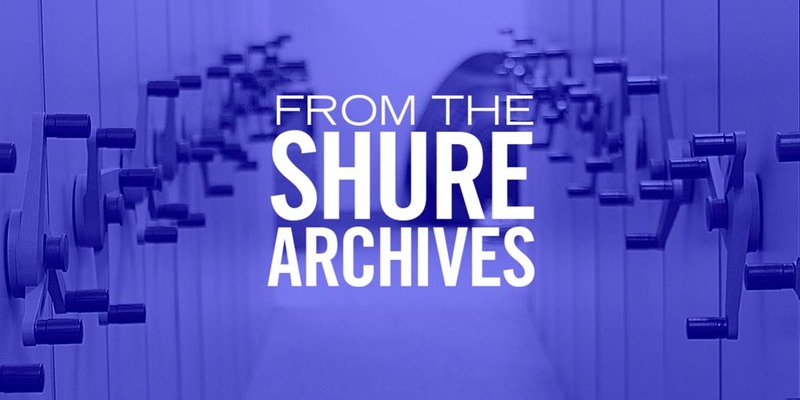 For years, a long wooden box wrapped in protective packaging lay undisturbed in the Shure Archives. Julie and I thought we'd seen a similar box in a vintage photo. Using a magnifying glass to examine the photo, we could see that the objects in the box were labeled "First Unidyne Cartridge," "Second Unidyne Cartridge," "Third Unidyne Cartridge" and so on. We knew that the seventh one was definitely the final cartridge for the Model 55 Unidyne. What we were looking at was the evolution of the cartridge design for the Model 55 Unidyne Microphone, an indispensable key to the company's history. Other artifacts from the Shure Archives, like Microphone Development Engineer Ben Bauer's 1930s lab books, authenticated the prototypes. A popular exhibit in current tours of the Shure Archives, the display case has been restored according to archivist specifications. Julie says, "If [an item] comes to you in a certain way, we rehab it without changing the way it was originally meant to be seen." In our in-house publication, Shure Shots, we recast the photo inside the Shure Archives with the company's most senior female Associates standing in for the originals.